The Seventh Judicial District Commission on Judicial Performance, by a unanimous vote (with one member absent and one vacancy), recommends Judge Julie J. Huffman BE RETAINED. 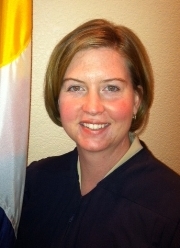 Judge Huffman received an undergraduate degree from University of Northern Colorado in 2001. She received her law degree from the Northern Kentucky School of Law in 2007. Judge Huffman was appointed as a County Court Judge in June of 2012. She is the secretary of the 7th Judicial District’s Bar Association and has ongoing training with the State of Colorado’s Judicial Training Programs and Colorado’s Legal Education opportunities. Judge Huffman currently works in private practice and has experience in domestic relations, guardianship and juvenile law. Judge Huffman previously worked as an intern with the District Attorney for the 7th Judicial District in 2008. The Commission was able to observe Judge Huffman in the courtroom, reviewed the survey results, conducted a personal interview, conducted interviews with the Chief Judge, the District Attorney, and the Public Defender and reviewed Judge Huffman’s written self-evaluation. Both attorneys and non-attorneys were surveyed regarding Judge Huffman’s performance. Of attorneys responding to the survey 50% recommended to retain and 50% recommended not to retain. Of non-attorneys responding to the survey 59% recommended to retain, 38% not to retain, and 3% made no recommendation regarding retention. However, given the small number of responses from both groups, the survey results may not be significant. As a county judge, Judge Huffman handles traffic, misdemeanor, criminal, civil cases under $15,000 including restraining orders, and small claims. Judge Huffman’s workload consists of 83% criminal, 52% traffic infractions, 15% misdemeanor, 12% traffic, 12% small claims, and 9% civil. The commission noted Judge Huffman demonstrated a great understanding of the role of a judicial officer and a high level of commitment to the bench. Overall, the commission unanimously voted that Judge Huffman be retained.